The Lathem 4000 series are side-printing, heavy-duty time clocks with automatic activation for simple one-hand operation and instant registrations.. 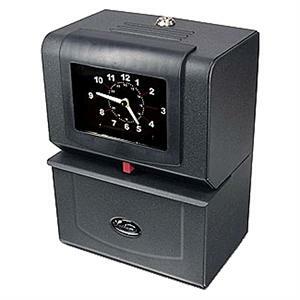 Built with a heavy-duty steel casing and high quality synchronous motor, these time clocks are designed to ensure time accuacy under high-volume use or in harsh environments. These workhorses are built to stand the test of time, and have been trusted by over 1 million businesses worldwide. Dimensions: 10.25" x 8.07" x 5.16"